I teach the uniquely balancing and healing Gita style of yoga. Weekly classes are offered in term blocks and occasional, short courses, workshops, retreats and taster sessions meet a range of needs as they arise. I create a space where everyone works at their own pace, from very gentle to gradually progressing levels of stretches, postures, breathing, relaxation and meditation techniques. The Gita tradition of yoga is designed for western bodies and minds, and offers a framework with comfortable and comforting patterns, inspiring progressions and nurturing variations that make the practices accessible to everybody (it is a myth that you need to be flexible to do yoga). Each class includes limbering stretches, self-paced steps towards postures, breathing, meditation and relaxation techniques. These elements blend over time to bring mental, emotional and physical (including hormonal) balance. Yoga unifies body, mind and emotions but this is not an end in itself. Each class will put you in the state you need to be in, on your path towards wholeness and, at your own pace, gradually tapping in to your true essence - who you really are, irrespective of the loads your are bearing, the masks you wear and the roles you play in everyday life. Your yoga begins from the moment you walk through the door. After your first class, your mind, consciously or sub-consciously, knows what to expect, your body begins to release tension in subtle ways and sends you cues about what it needs in each moment. You have at least fleeting moments of becoming aware of your thoughts and the natural flow of your breath. The settling process has begun. Many of us find, over time, that it is as if we enter a nurturing, protective bubble or cocoon. We feel supported by the teacher’s voice and the group energy but we quickly become oblivious to the people around us. This is one of what I call the great ‘healing paradoxes’ of yoga – a sense of anonymity within a group of people moving together. If you can muster a deep commitment to yourself and bring yourself to your class every week, regardless of life’s ups and downs, you may soon experience yoga as a ‘drip by drip miracle’. We take the view that coming together in yoga naturally protects us from any contagion, so no need to isolate yourself if you are unwell. 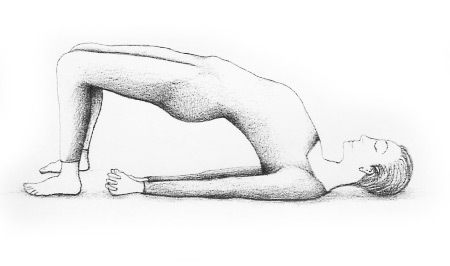 If you feel ill, weak or in pain it is perfectly acceptable to simply lie down for the class, visualise yourself in the stretches and postures and draw on the healing energies in the room.